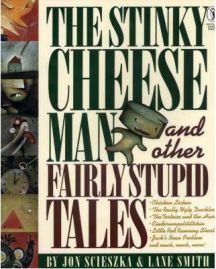 It is probably obvious from the title that The Stinky Cheese Man and Other Fairly Stupid Tales is a collection of alternative versions of traditional fairy tales. Author Jon Scieszka offers “Cinderumpelstiltskin”, “The Tortoise and the Hair”, “The Princess and the Bowling Ball” and “Jack’s Bean Problem” to name but a few. “The Stinky Cheese Man” of the title is an alternative to “The Gingerbread Man”, but the cheese man smells so dreadful that nobody wants to chase him. The title page has the words “Title Page” set in huge letters, and on the next page the dedication is printed upside-down. The reader is clearly in for an off-beat ride.